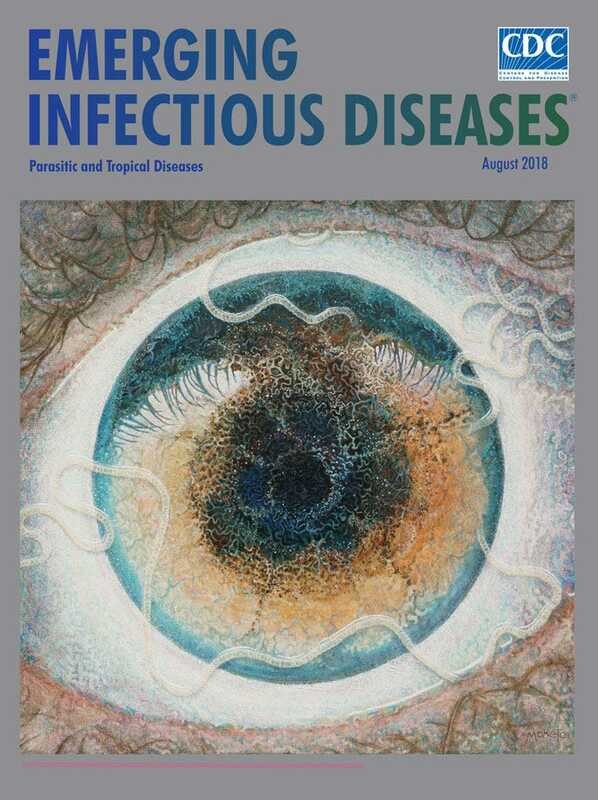 The cover of a medical journal published by the Centres for Disease Control features a haunting image of a human eye covered in parasitic worms. These worms, known as Loa loa or African eye worms, are parasites that infect approximately 12 million people. The artist who created the cover image did so after a personal encounter with Loa loa worms – an experience he describes as a blessing in disguise. 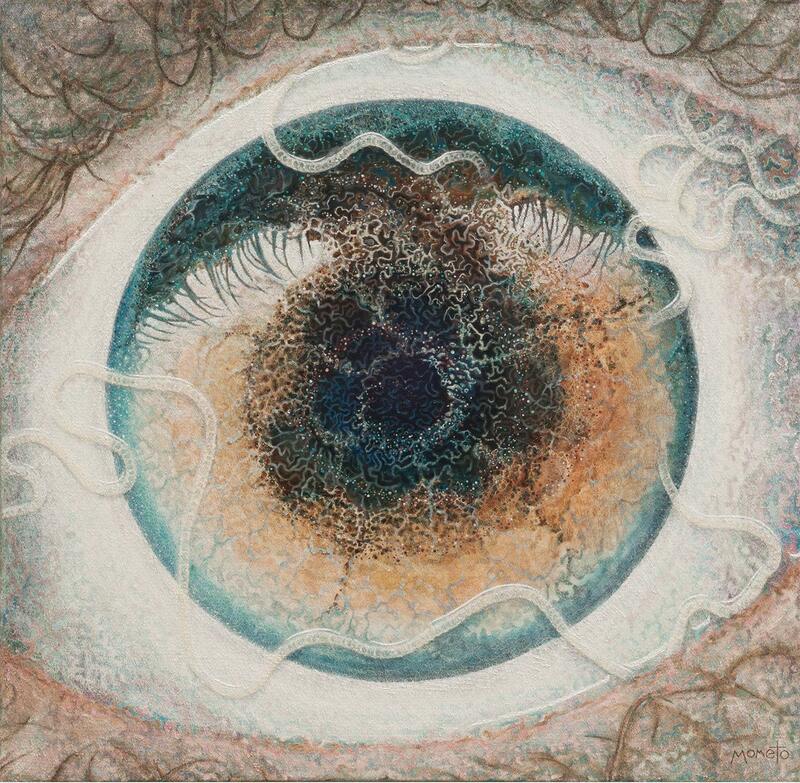 A medical journal published by the Centres for Disease Control and Prevention featured a striking cover image this month: a painting of a human eye covered with long, undulating worms. The work depicts parasitic nematodes, also known as Loa loa worms or African eye worms. The parasites are spread primarily by the bites of flies in Central and West Africa. People often don’t realise they’re infected until they spot a worm wriggling in their eye. But the story behind the painting is more personal than the image lets on. Artist Ben Taylor, who uses the name Mometo for his artwork, started working on the painting in 2014. At the time, it was an abstract image filled with curving patterns, twisting shapes, and flecks of colour, as he explained on his website. Before starting the painting, Taylor had travelled to a village in the jungle in Gabon during the summer of 2013. He’d been experiencing health issues that doctors had been unable to explain, including joint aches and pains, bumps and itchy patches on his skin, and painful abscesses that required hospitalisation. In Gabon, he underwent what he described as an intense healing ceremony. After his return to England, however, Taylor’s health further deteriorated. Over the next year and a half, the medical problems he’d been experiencing got worse. Then, a new symptom appeared. A reoccurring, blinding pain in his eye caused Taylor to stare at it in the mirror until the culprit revealed itself: a wriggling Loa loa worm that was more than an inch long. Taylor checked in for treatment at the London School of Tropical Diseases, where doctors found two other parasites that had “been partying inside my body for an unknown amount of time,” he wrote. As it turned out, Taylor also had hookworm and Strongyloides, known as threadworm. As an extensive traveller, he does not know where he contracted those infections – only that they had been missed in previous tests. “Despite this seemingly bad news, I now understand the blessing of being infected with Loa loa: without this infection, the other parasites would have remained hidden, and the long term consequences of this would have been grim,” Taylor wrote. During a stay in the hospital, he received anti-parasitic medications. When recovering after treatment, Taylor returned to the painting and realised that the abstract image was not yet finished. Taylor saw that the piece he’d started centered around “long undulating lines that, with hindsight, had a distinctly wormy look and feel,” he said. In general, infections by these worms are painful and disturbing, but less harmful than infections by other similar parasites. For example, Onchocerca causes river blindness, a common and severe neglected tropical disease that’s spread by black-fly bites and can leave people permanently blind and with disfigured skin. Loa loa infections are still medically important, though, since they are believed to affect 12 million people, with more than 29 million people at risk of infection. When patients have a combination of Loa loa and other forms of eye-worm infections, including Onchocerca, common anti-parasite treatments can become dangerous and potentially deadly, causing brain swelling that can lead to coma or death. Scientists aren’t why this is, but they think killing vast numbers of parasites at the same time may overload the host’s defences in some way. So getting a better understanding of these creatures is necessary. In Taylor’s case, the discovery of the eye worm led his doctors to find other potentially harmful infections in his body, which made treatment possible.